(AUSTIN) — Texas Comptroller Susan Combs recently announced that state sales tax revenue in November was $2.34 billion, up 13.1 percent compared to November 2011. Combs will send December local sales tax allocations totaling $552 million to cities, counties, transit systems and special purpose taxing districts, up 15.5 percent compared to December 2011. 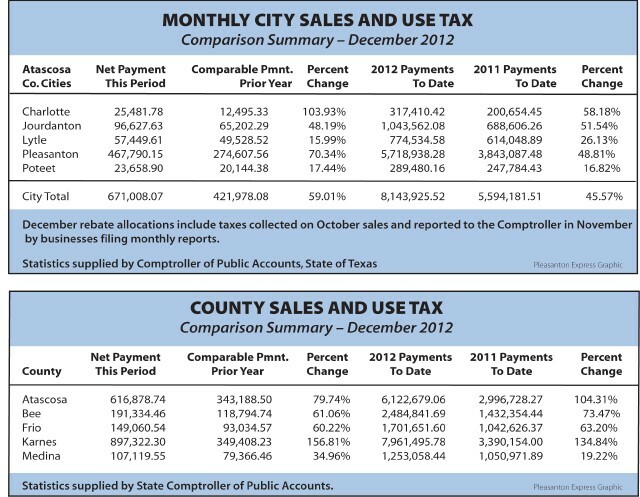 The sales tax figures represent October sales reported by monthly tax filers.